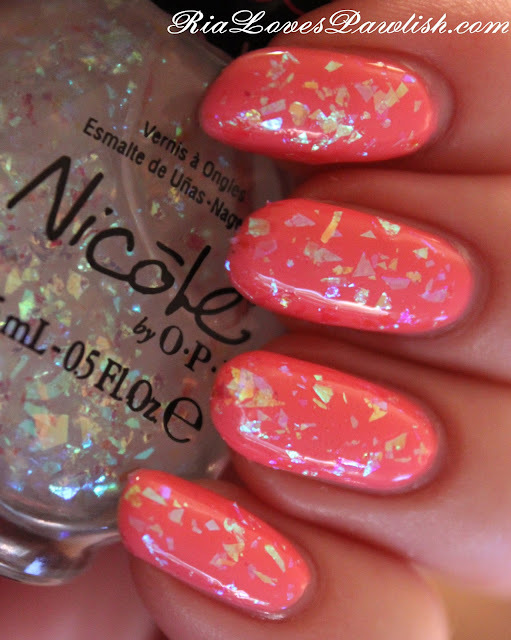 today's polish is Nicole by OPI Heavenly Angel from their Selena Gomez collection. it's one of those that i knew i didn't need, but i just couldn't resist... when i see flakies i just have to possess them! this flakie is an iridescent shard flakie, shiny and pastel. since it's an iridescent color, i thought it would look amazing over my Sally Hansen complete Salon Manicure I Pink I Can mani... and i think i was right! the formula of this polish is better than some flakies i've tried, for sure. i used two thin coats and didn't have to fight with the flakes too much or place them very them often. my ring nail was the exception, i did have to add another coat and work with that nail a bit more. i did try and hold the bottle upside down a bit before opening it to move the pieces down and swirled the brush around really well to pick up as many pieces as possible. to smooth the pieces out you'll want to add topcoat, it will also pull the whole mani together! you may need more than one coat if you need your nails to be completely smooth, but a little texture doesn't bother me. two coats Heavenly Angel, one coat Seche Vite, all over my Sally Hansen complete Salon Manicure I Pink I Can mani.